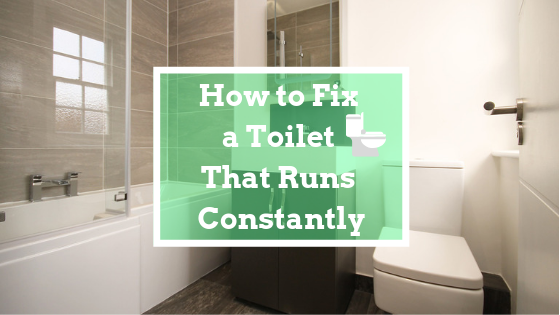 A constantly running toilet is a major annoyance. You know something is wrong. It is a toilet flushing problem for sure, but why is the toilet is constantly running? Is it an expensive thing to fix? Will it require plumbing repair? Before we get into reasons you may be having this running toilet water problem and how it can be fixed, there is another important consideration to be aware of: the money you are literally flushing away! In many older homes, particularly ones that have not had full bathroom renovations, an old toilet could be flushing as much as eight gallons of water per flush. Compare this to a modern toilet that is operating at the current federal standard of 1.6 gallons per flush. Many toilet gallons-per-flush (GPF) fall somewhere in between. It has been established that the average number of times one person flushes a toilet per day is five. The range of gallons flushed per person per day is between 8 and 40. In a typical family household of four people that’s between 32 and 160 gallons flushed each day. The most wasteful scenario is 4,800 gallons per month. A constantly running toilet can easily waste an additional 6,000 gallons a month! Your water bill could include an unnecessary $200 a month, or over $2,000 a year. That figure could be much more due to water rationing in the Bay Area. That’s money that brought you no extra value. It was simply flushed away. And if you are like most environmentally-conscious people, that kind of waste goes against the grain. Let’s just make it clear that if you have an older toilet, your sense of thrift may be misplaced. Toilets use more water than any other feature of a house by far – about 30% of all water consumption. A toilet with constantly running water wastes about 25 times more water than a shower leak and four times as much as a continual faucet leak. Ben Franklin Plumbing in the Bay Area is not only well-respected for fast and efficient plumbing repair, but we are leaders in kitchen and bathroom fixtures and design. If you would like to upgrade your toilet, we can provide a full array of choices to suit your home and your personal style. Is Your Toilet Leaking? Here is a Quick Test. If you are hearing running water in your toilet, the problem is in the toilet tank. You can easily verify this by removing the lid on your tank and putting a few drops of food coloring in the standing water. Don’t flush your toilet for about half an hour. Has the coloring migrated to the water in the bowl? If it has, you have a running water leak. Constantly running toilets leak into the waste pipes and may not be detectable by the sound of running water. If your toilet is leaking, you may only become aware of it by a higher water bill. Most commonly it is an internal leak in the tank and can be easily heard. The following are the most common areas causing the problem. The toilet flapper ball: Lift the lid on your toilet tank and depress the flush handle. You will see the toilet flapper lift and release the water in the tank into the toilet, allowing it to flush. When enough water is released, the flapper drops and seals the tank so it can be refilled with water. A cracked or worn flapper that doesn’t properly seat will allow water to continually run. Flappers are usually made of soft material that can decay over time. If this is the case, turn off the water supply on the wall behind the toilet (NOT the main water supply) and flush the toilet. You should be able to easily unhook the flapper and remove it. Bring it to your hardware store and get a correct sized replacement and reinstall. Problem solved! The toilet chain: The toilet chain connected to the flapper can get tangled if it is too long. Untangle it or unhook it at the top and rehook it one notice shorter. Ensure it still allows the flapper to fully seat. Float ball and float arm. When the toilet tank is filling, the float ball position lets it know when to stop. Flush the toilet and when the tank is filling, gently lift the ball. Does the running that you’ve been hearing stop? If so, the problem is in this area. Make sure the ball isn’t touching the sides of the tank. This can cause the ball to stick and never lift enough. If it is, bend the float arm slightly so the ball stays free of the sides. Does the ball have a crack in it and is draining water? If so, it will sink below the proper level and allow water to continually run. Replace the float ball. It may be that the tank is overfilling beyond the mark on the inside of the tank wall. Mark the proper water level on the overflow tube. That’s the vertical tube with a fill tube sticking in it from the top. If the float ball is set too high, the water level spills into the overflow tube and won’t shut off. With older toilets, you can bend the ball up or down and test it to adjust to the proper water level as you marked on the overflow tube. Newer toilets have screw or sliding clip adjustments to make it easier and more accurate. If the above fixes do not resolve this issue, you may have a stuck fill valve, or the ballcock assembly may be faulty. Both would need to be replaced. They are easy to replace and come with installation instructions. However, whatever you buy must be compatible with the rest of the toilet tank assembly. If it is a fill valve or ballcock that needs to be replaced, we recommend calling Ben Franklin Plumbing in the Bay Area. We can save our clients several trips to the hardware store and the frustration of replacing parts. Often, we have the needed parts with us. For a fraction more cost, we can update the entire tank assembly, so you aren’t faced with a series of breaking parts. At the same time, we can evaluate the general state of your toilet. If your toilet is an older porcelain model, you may be surprised how an upgrade will improve the look of your bathroom – and lower water bills.